In his final test match, Alastair Cook delivered. England’s other batsmen did not. Cook led England with 71 before it collapsed to 198-7 against India on day one of the fifth test at the Oval on Friday. England and Cook appeared to be cruising toward a perfect day, with the former captain and Moeen Ali (50) guiding the home team to 123-1 at tea after Joe Root won the toss and chose to bat. However, when Cook - playing in his 161st and last test - played onto his stumps from Jasprit Bumrah shortly after tea, a familiar England collapse followed. “Because of the emotion I just did not want to not get a score,” Cook said. “I was so determined because there is nothing worse than going out and not contributing. “All the fuss about the week and you don’t deliver the goods. I was just as nervous as I am usually. Everyone says, ‘Just enjoy it, it doesn’t matter how many runs you get,’ but that is never the case. England looked well set after Root completed a clean sweep of toss victories for the series and chose to bat in the London sunshine on a surface that offered minimal help for India’s bowlers early on. That position was gradually consolidated over the first two sessions as Cook - first alongside Keaton Jennings and then Ali - guided England to 123-1 at tea. After struggling his way to 23 to share a first half-century stand of the series with Cook, Jennings somewhat gave his wicket away, flicking the recalled Ravindra Jadeja (2-57) straight to leg slip shortly before lunch. A spell of five maiden overs after lunch saw Cook dropped on 37 by Ajinkya Rahane at slip off the bowling of Ishant Sharma, then India captain Virat Kohli failed to take a tough chance to catch Ali on 2 off Bumrah in the following over. Cook and Ali took advantage of their reprieves, sneaking through to tea, though scoring at a rate of well under two runs per over during the middle session. 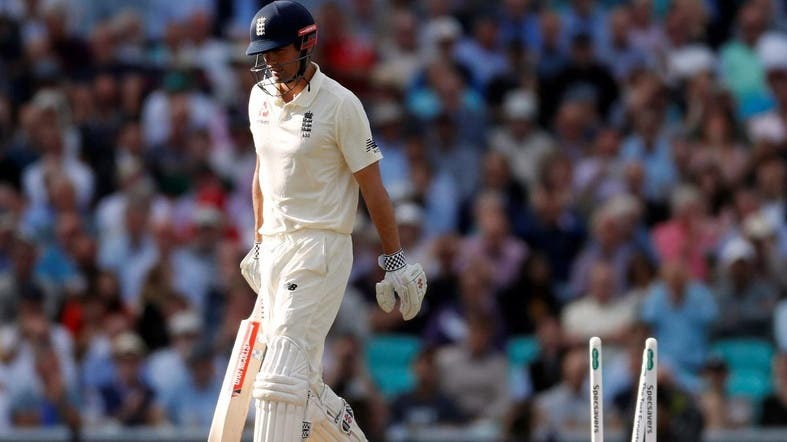 Having received a standing ovation - and a guard of honor from India - as he walked out to bat at the start of the day, Cook earned another by reaching his first half-century of the series, from 139 balls. Despite the steady rate of progress, England appeared perfectly placed to take advantage of a tiring India bowling attack in the evening session, with Cook edging closer to a fairytale ending to his career. With England having already won the series and no luck going India’s way at the Oval, the touring side’s bowlers could have been forgiven for wilting. Instead, they showed resilience to maintain their discipline, and finally got the rewards they deserved. A gasp of disbelief went up around the ground as Cook, just 29 short of the farewell century he and the home crowd craved, inside-edged a Bumrah delivery onto his stumps and was forced to walk off, albeit to a rapturous ovation. England’s shock levels quickly increased, as Bumrah (2-41) struck again in the same over to remove Root lbw for a three-ball duck. In the following over, Sharma (3-28) induced an edge from Jonny Bairstow (0) through to wicketkeeper Rishabh Pant, leaving England 134-4. Left-arm spinner Jadeja, back for the injured Ravichandran Ashwin, defeated Ben Stokes on 11 with a quicker delivery to leave the umpire with the simplest of lbws. India had another new spinning option courtesy of allrounder Hanuma Vihari, who received his test debut in place of Hardik Pandya. But Vihari was given only one over. England’s new No. 3 batsman, Ali, reached his guarded half-century from 167 balls. But he lasted only three more deliveries as Sharma had him caught behind for 50. Two balls later, Sharma got Sam Curran for a duck. “Everyone bowled well,” Jadeja said. “Especially when the partnership between Moeen Ali and Alastair Cook was on, our plan was to stop the boundaries. England’s hopes of posting a competitive first-innings total rest largely on Jos Buttler, on 11 not out, who made it to stumps alongside Adil Rashid, 4 not out.